One of my favorite activities this time of year is to watch The Masters golf tournament. Growing up in snowy New England, The Masters always represented the coming of Spring for me. The ultra green grass, the azalea bushes and even the chirping birds are all signs of a new, better and warmer season ahead. The other thing that always impresses me about this tournament is how incredibly well mannered the crowd is. I’ve watched and attended many professional golf tournaments. The behavior of the crowd at these events is generally becoming worse over the past few years. Some of the tournaments actually have the feel of a college keg party. It’s hard to watch a golf tournament these days without having to listen to “fans” shout absurdities such as “You ‘da man”, “Baba Booey” or “Dilly Dilly” immediately after every shot. The Masters is different. The spectators at the event are actually referred to as “patrons.” Yet, it strikes me how a group of 40,000 (daily) patrons behave so differently from almost every other crowd at every other professional golf tournament in the world. Why is that? Can the behavior of 40,000 ardent golf fans actually be shaped in a substantive and meaningful way? Every single part of this event is planned with meticulous attention to detail, far in advance of the tournament. Nothing is left to chance. 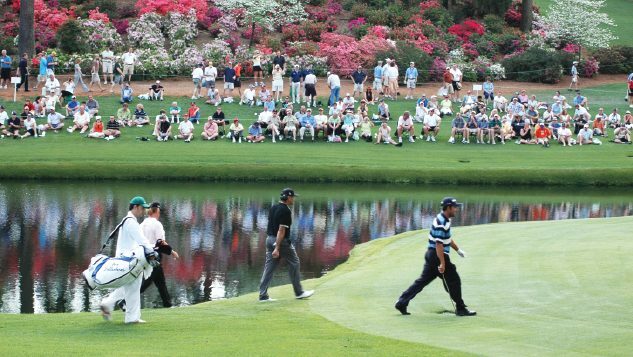 Everything from when the azaleas are to bloom to the very specific behavior of the patrons has been discussed, debated and planned years prior to the annual event. As our founder, David Friedman, suggests in his new book, Culture By Design, “when people come together, a culture forms.” This is true of any group of people, even fans attending a golf event. The Augusta National Golf club recognized this a long time ago. They also recognized the need to be incredibly purposeful in designing the type of golf event they wanted and how they wanted those in attendance to behave. It doesn’t get much clearer than that. Beyond this clarity, they hold people accountable. Patrons have been asked to leave the premises if and when they are not living up to the standards that have been set. Those that commit lesser infractions such as running from hole to hole, lying down on the grass or speaking too loudly are kindly asked to refrain from such behavior. Not that any of this is easy. It takes planning, intention, consistency, and time. However the results of all of this produces the most admired of all professional golf events (not to mention the toughest ticket to obtain). Think of this from your organization’s perspective. If a determined golf club committee can shape the behavior of 40,000 fans per day, while producing the most revered event in all of golf, imagine where you can take your company by doing the same! If you’d like to learn more about how to shape the behaviors and culture of your company, give us a call or shoot us an email. See you on the course.